The world learned recently that another heirloom tiara from a former royal family is hitting the sale room this year. 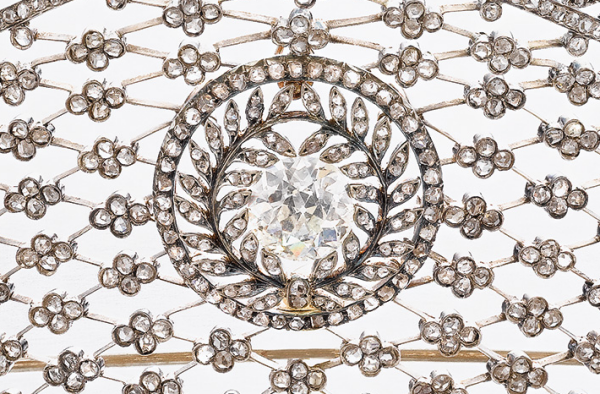 Here's a closer look at the tiara in question: a diamond sparkler from the collection of the last German crown princess. The kokoshnik-style tiara was made around 1903, and although it is unsigned, it has often been attributed to Fabergé. (A similar Fabergé tiara was included in Geoffrey Munn's landmark tiara tome.) 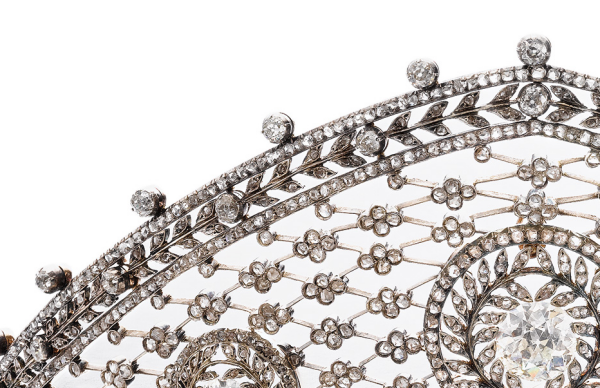 The lot notes from Sotheby's describe this tiara as "set with three circular-cut diamonds framed with stylised laurels within an arched surround of lattice work design joined with rose diamond quatrefoils." The tiara was one of the wedding presents given to Duchess Cecilie of Mecklenburg-Schwerin when she married Crown Prince Wilhelm, son of Kaiser Wilhelm II of Germany, in June 1905. 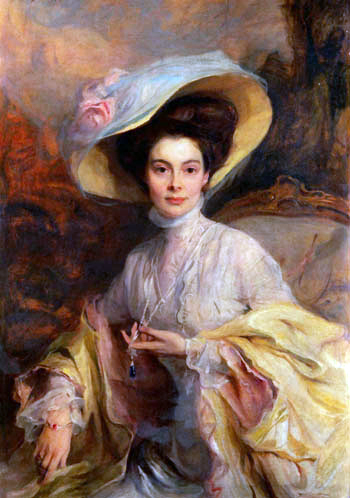 The sparkler was a gift from Cecilie's Russian relatives -- her mother was the fascinating Grand Duchess Anastasia Mikhailovna of Russia, a granddaughter of Tsar Nicholas I. Anastasia herself may have had a hand in selecting the tiara; Fabergé was her favorite jewelry firm, and the lot notes for the tiara state that "correspondence between the jeweller and [Anastasia] herself, mentioning a diamond tiara, exists." Crown Princess Cecilie was photographed wearing the tiara, but it was her daughter, Princess Cecilie, who perhaps made the most significant appearance in the diadem. After the end of World War II, the younger Cecilie fell in love with an American designer named Clyde Harris. He was one of the Monuments Men, the group of American soldiers tasked with recovering priceless works of art that had gone missing during the war. Harris, who hailed from Amarillo, Texas, was sent to Wolfsgarten Castle to investigate the famous theft of the Hessian royal jewels. During that investigation, he met Cecilie. After a lengthy correspondence, the couple decided to marry. The wedding took place in June 1949 at Hohenzollern Castle. The wedding guest list was populated by both royals and Texans, including the mayor of Amarillo and the editor of the Amarillo News-Globe. The American press reported on all the details, including Cecilie's attire: "A peaked diamond tiara glittered on the bride's head, holding the plain tulle veil her sister-in-law brought her from London. The tiara had belonged to her mother's mother, a grand duchess of Russia." (Perhaps that last detail helps confirm Anastasia's central role in the tiara's creation and acquisition? Mr. Harris and his new bride settled after their wedding in Amarillo, where they later welcomed a daughter, Kira Alexandrine Harris. (Her names paid tribute to Cecilie's sister-in-law, Princess Kira, and her aunt, Queen Alexandrine of Denmark.) Cecilie even became an American citizen. Sadly, Clyde and Cecilie's happiness was short-lived. Clyde died suddenly of a cerebral hemorrhage in 1958. He was only 59. Cecilie lived until 1975, dying on a trip to her native Germany. The lot notes for the sale of Princess Cecilie's wedding tiara do not indicate the identity of the seller. Instead, they merely explain that it was inherited by a family member after the death of Crown Princess Cecilie in 1954. The tiara will be auctioned in Geneva on May 14. It is currently expected to fetch between $200,000 and $300,000.